It's probably not a "new" trend per se, but for the past couple of months this trend has caught my eye and I love it! I feel like the ankle strap adds an extra feminine and classy look. 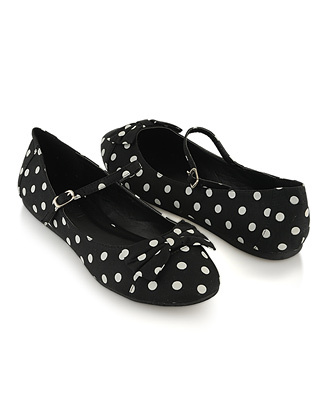 Also, it's great for those people that slips out of their heels or flats easily like me (^^;) . Here are a few examples and inspiration of how to wear them. These picture don't belong to me. I would show how I would style them, but I don't really have shoes with ankle straps on them yet. I only have one pair and they are flats. I've been trying to save money and find the "perfect" pair of ankle strapped heels. My mom has a couple of pairs so maybe in a later post I'll post how I would wear them, but it's going to look a little funny on me since her shoes are not my size (^^;) . I'll make it work. Maybe I'll stuff it with toilet paper or something (≧∇≦). Here are a couple of shoes that I found online with ankle straps I like so I'm going to share it with you guys~. I absolutely LOVE this pair. I can basically wear it with any outfit since it's a neutral pink, and it just adds the right amount of color in a plain outfit. It won't be too overwhelming like red. Plus, it's flats! So it will be comfy to wear. The pointed toe part of the shoes also help elongate your legs, too. **Basically any shoes that is pointed will give this allusion (☆^ー^☆). I actually have this pair but in reverse color. The one I have is cream colored with black polka dots. These 3 pumps/mary janes are like the classics. If I had enough money I would get one of each color LOL. These are the three I really like. I would buy them in the same order it appears, too. When I first saw these they were actually patent leather heels, but I can't find the pictures of them anymore on the site. **Little tip: If you think you would trip and fall when wearing heels, I would try suede heels rather than patent ones. If you get a scratch it'll be less noticeable and easier to hide. This pair is so edgy. I love it haha! I really like the studs and spikes in the back. It's also a wedge so it'll be pretty comfy to walk around in. There is also a platform which gives you extra height and the peep-toe is just the right size which will elongate the legs and the dainty ankle strap adds an feminine touch to these edgy wedges. I would love to get this pair if I have extra money, but I already have a pair of lace-up wedges that are black that I really like so I probably won't. If this pair goes on sale then maaaaaybe I'll get it. Just maybe.